Known for its mysterious surrounding and astounding scenic beauty, Roopkund is a high altitude trek in the base of Trishul Peak and Nanda Ghunti. 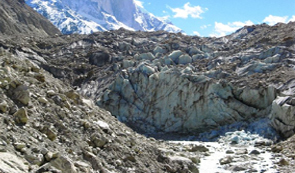 The maximum height of this trek is 5029 m which adds to the zeal of trekking experience. The trek lies in the Garhwal Himalayas of Chamoli district and offers magnificent views of mountains surrounded by rock- strewn glacier. This 9 days trek goes through moderate to difficult grades and satiates the trekking-obsession of beginners to high altitude experts. The lake at Roopkund is also known as a 'mystery lake' for the human skeletons and remains of horses that are found in huge numbers in the surrounding areas of the lake. These remains are believed to be of around 15th to 16th century when a strong hailstorm took away the lives of hundreds of helpless people who went there for pilgrimage. 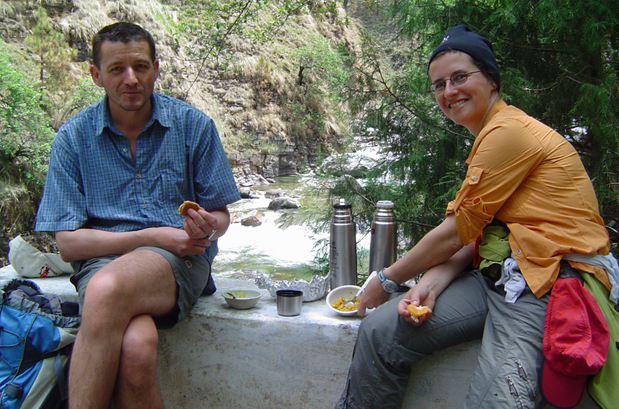 Lohajung is the base of this well acclaimed trek which is easily accessible by motor from Rishikesh. 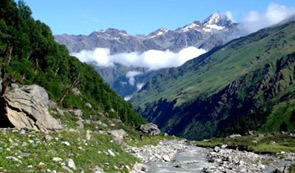 Generally the trekking teams drive from Rishikesh to Loharjung witnessing the snow-packed mountains, valleys and rivers. The original trek starts from Lohajung and passes through the village of Didna. In between Loharjung to Didna, there is a small village called Kulling where the bubbling river Neel Ganga flows between Wan and Lohajung. 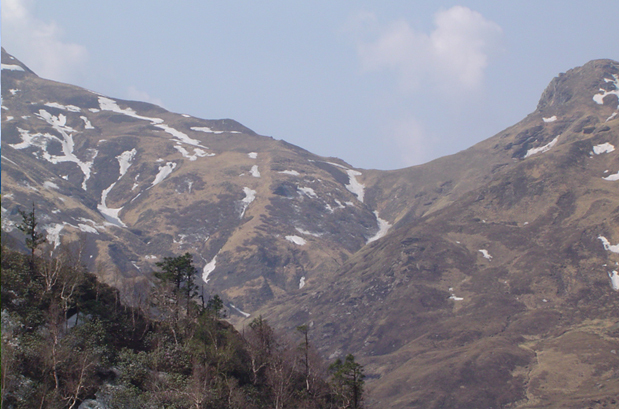 From Kulling a steep ascent leads to Raun Bagad which is partly thick and densely dotted by the rhododendron oaks and pine forest. All along the walk the trekkers can hear the whistles of the thrushes and twittering of birds. Catch a glimpse of fork tailed Himalayan Magpie on the branches of Rhododendrons. On the lower levels of Neel Ganga River, Lammergeiers are found soaring over the valley. One can also see yellow throated marten. The trail to Raun Bagad ends at an iron bridge from where the climb to Didina starts. From Didina the trail leads towards Bedni Bugyal which again passes through Ali Bugyal. The trail from Didina to Bedni Bugyal is a stiff climb at the beginning and through an easy walk in the middle it ascends towards the end. The undulating Alpine meadows at Ali Bugyal are considered to be among the best in the country which are located atop a ridge. The trail from Ali Bugyal to Bedni Bugyal is carpeted with soft green grassland. 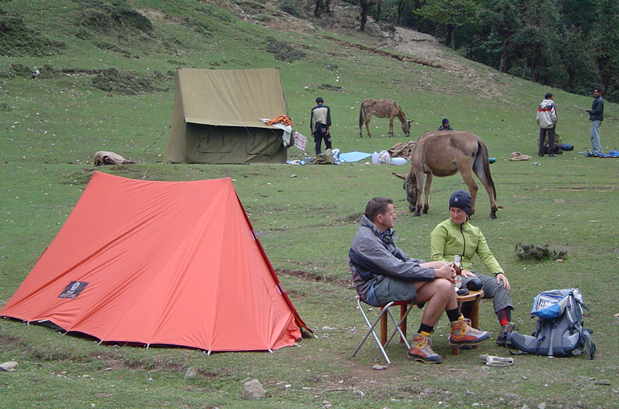 Those who would like to camp on the Himalaya, Bedni is the ideal place. Witnessing the evening reflection of sunlight on Trishul Mountain peak is a memorable experience. From Bedni Bugyal one has to lead towards the meadows of Ghora Lotani where the vicinity is painted with the shades of olives and browns spread across all directions over the black terrain. 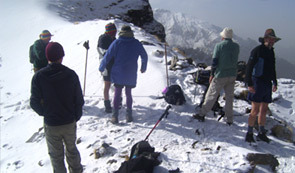 Trekkers can witness abundant snow while reaching Bhagwabasa. Further one needs to head towards Roopkund from Bhagwabassa which is a 5 km ascent. There are series of switchbacks and a steep climb over the snow patched route but the stretch is not long and the hard snow is helpful to trek without being worried about the danger. Roopkund can be trekked between May and June and August and mid-October. The harsh climatic conditions only provide trekkers with a small window to trek between the 1st week of May to about the 1st week of July. June is the perfect time to witness the twin Bugyals /meadows of Ali and Bedni as by this time, the meadows are in their full spring. Trekking between the last week of August and the first week of October is another good trekking season in Roopkund. The sky remains clear and the weather is perfect for a hike. 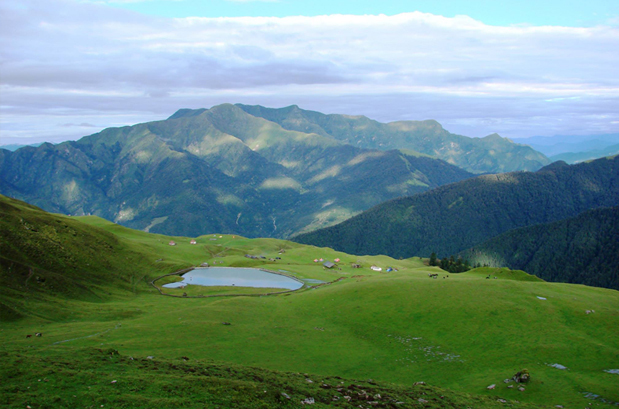 Roopkund is situated in a remote area of Chamoli District of Uttarakhand State. 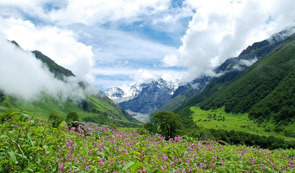 It is an isolated place with no permanent human settlements in the vicinity, Roopkund is surrounded by glaciers and situated near the base of two Himalayan peaks Trishul, and Nanda Gunti. Despite of its increasing popularity, it generally remains inaccessible for six months in a year because of its high altitude and continuous snow. By Air: Dehradun is the closest airport for reaching Karnaprayag. Scheduled flights operate to and from several major cities in India. By Rail: The nearest rail head from Karnprayag would be Haridwar/Rishikesh. 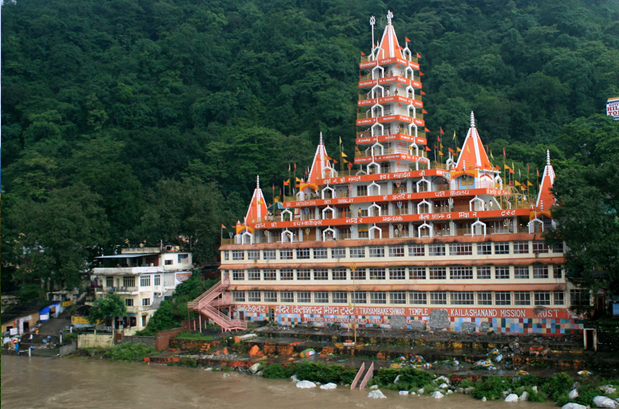 Haridwar is well-connected to major cities of India, whereas in Rishikesh the number of trains is comparatively less than Haridwar. By Road: Haridwar, Rishikesh, Dehradun are well connected from Delhi. One can find taxis to Loharjung from these destinations. On an average, Loharjung is 210 kms from Rishikesh. In the morning take an AC train for Haridwar at 06:50 hrs. After arriving in Haridwar, meet our representative who will help you with transferring to Rishikesh and check-in in to your hotel. Evening time is free for leisure activities. Overnight stay at the hotel. Today, we will drive along the River Ganges to reach Wan. En route visit the famous places of religious importance. Continue to drive further via Rudraprayag and Karanprayag to reach Wan by evening. Dinner and overnight stay in tents / tourist rest house. After the breakfast, we shall head towards the enchanting villages of Wan to reach the ridge of Rankiyadhar. From here, the trail descends to the river Neelganga River. After crossing the river, we will pass through the dense forests of Rhododendron and Oak to reach Gairoli Patal. The trail still continues to ascend to the Dolia Dhar ridge, which is marked with a temple. The trail then continues towards the meadows at Bedni. Overnight stay in tents. Today, we will explore the region of Bedni Bugyal and capture wonderful photographs of nature. This is a rest day to acclimatize. Overnight stay in the tents. After the breakfast today, we will trek from Bedni to Bagubassa via Patar Nachaniya. Overnight stay in tents. Post breakfast, we shall trek from Bagubassa to Roopkund. The trail passes through alpine pasture lands that offer a fantastic view of Trishul, Nanda Ghunti and Badrinath peaks. Later, the trail becomes steep as we get near to the Roopkund Lake. After exploring the area and taking the pictures, we shall return to Bedni Bugyal. Overnight stay in the tents. In the morning today, we shall trek from Bedni to Wan. The trail goes downhill and offers wonderful opportunity to enjoy the forest trail. Upon reaching the road head, we will drive towards Rudraprayag. Overnight stay in the hotel. 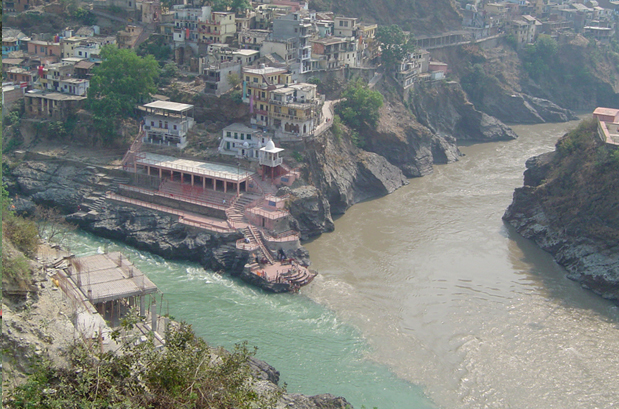 After the breakfast, drive towards Haridwar via Devprayag and Rishikesh. After arriving in Haridwar, catch a train for Delhi at 18:05 hrs. Arrival at Delhi by 22:45 hrs. 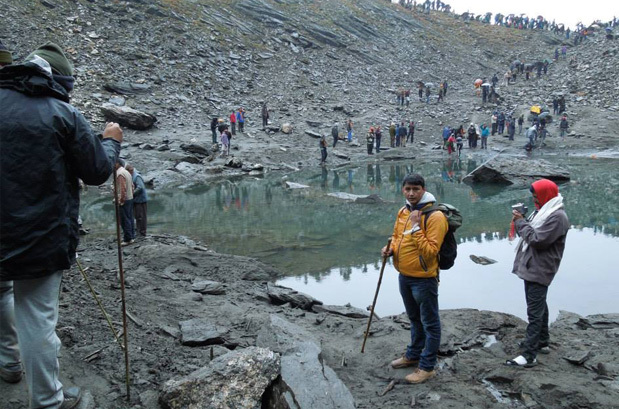 When to book Roopkund Trek? 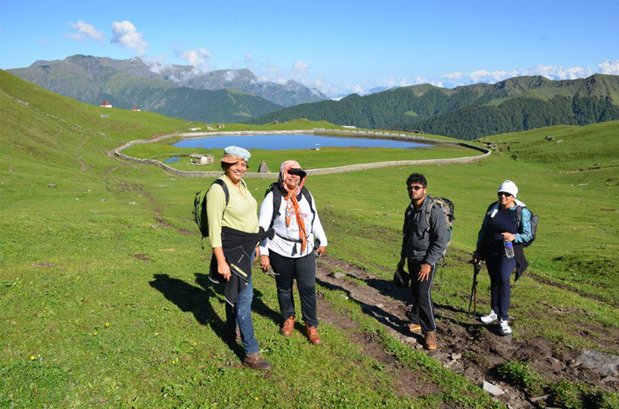 You should book Roopkund trek two months in advance so that you get ample amount of time to prepare for the trek. 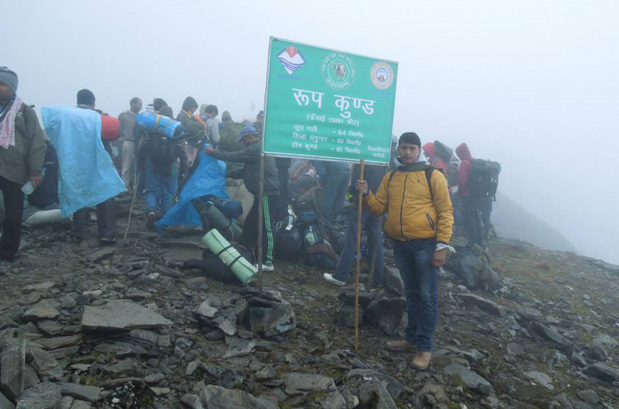 Our pick up and drop point for Roopkund Trek is New Delhi train station at platform no. 16. We will hand over the tickets to you and then pick you up at Haridwar Railway Station from there your tour will start. 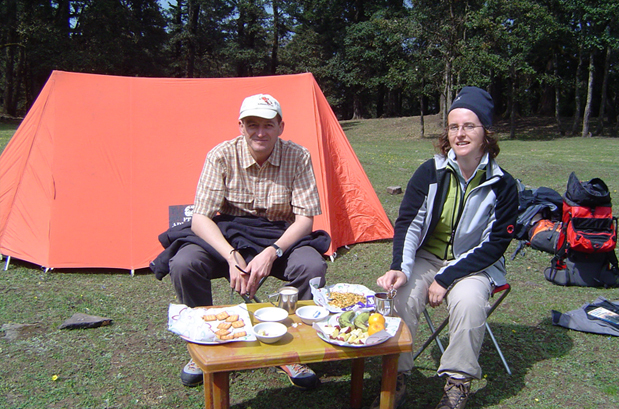 We have an experienced Roopkund trekking guide who shall lead the trek. What is minimum age required for Roopkund Trek? Roopkund Trek is a moderate trek with a maximum altitude of 5029 mts, so the minimum age required is 12 years. What will be the minimum temperature during Roopkund Trek? In the month of May and June, the temperature during the trek can go as low as 16 Degree Celsius during the night and in between September and October, the temperature can drop to minus by night. 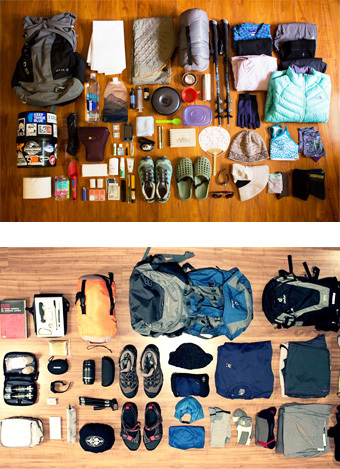 How long we trek during Roopkund Trek? 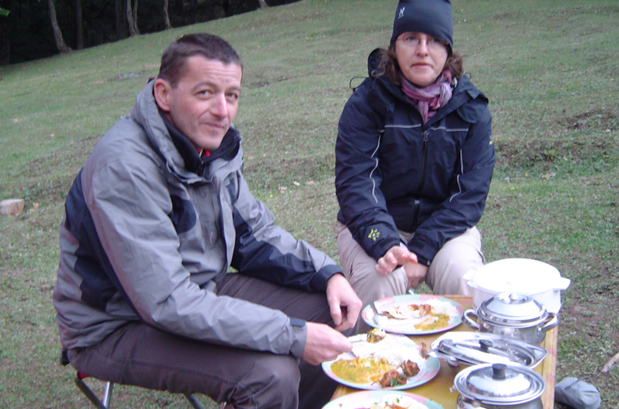 We plan our treks in a way that after 6 hours of trekking we can reach next camp around the lunch time. 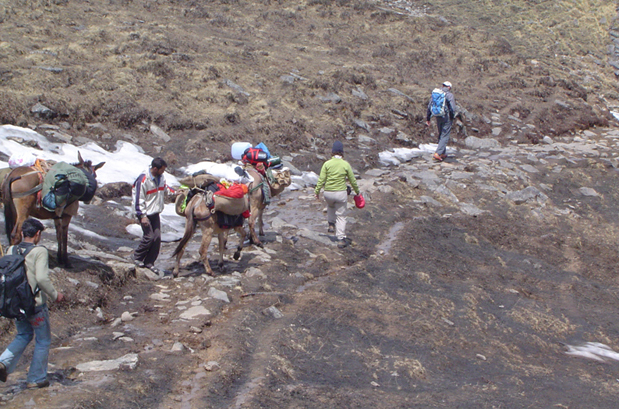 Normally, 8-12kms per day of trekking is required. How do we deal with emergency situation?